I've written a post previously of how to get sky ADSL broadband working with a Cisco router HERE however this particular implementation just got upgraded to Fiber (or VDSL). So, I've had to update the configuration on the router to get VDSL working. The model of router I am using is a Cisco 897VA which supports both ADSL and VDSL and will automatically switch between a logical ATM and Ethernet interfaces. Sky seem to like locking their configuration down so it's rather difficult to get it working. Many ISPs lovingly provide details on how to get their services working with 3rd party routers - not Sky however! First things first, you'll need to figure out your username and password. Not an easy feat. 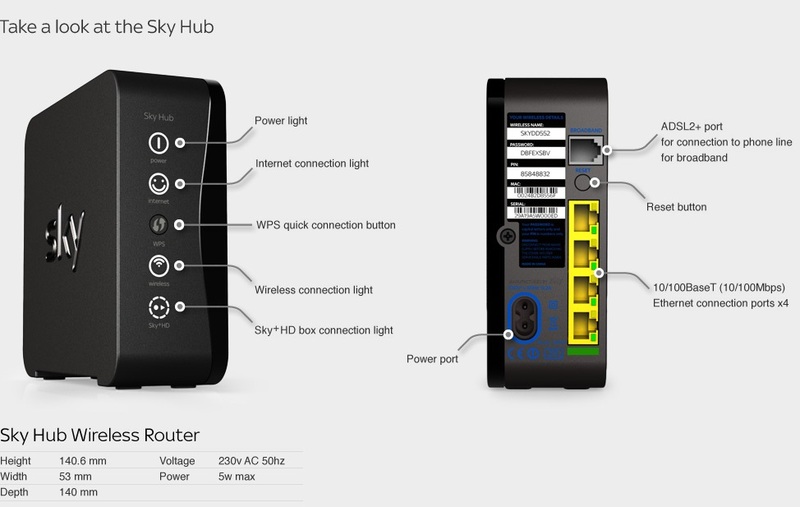 I've only dealt with a Sky SR102 router which was being used before hand. You'll need the MAC address of the LAN port. Now I believe that is written on the back of the hub as in the picture above. However I would check either by logging into the GUI of the router and taking a look, or performing an arp lookup on your PC to see what the mac of your default gateway is. It's imperative that the next step you use the MAC of the LAN port. Next, use the following tool: http://www.ph-mb.com/products/sky-calc and enter your information. If you're using the SR102 you can choose the Sagem F@ST option and that seems to work. mac-address lanmac !I'm not sure how important this is - but I set it anyway. Remember to change over your NAT overload rule to the new E0.101 interface. ALWAYS use E.101 with .1q encap for 101. This is the VLAN used for sky to encapsulate the traffic, it's not going to get far without it. I'd recommend ACLs etc to prevent the nasties getting in...I've omitted them here but rest assured they are there! Just check for any references to any old instances of Dialer0 (or whatever else you're using) and replace it with E0.101. I had one in my DMVPN configuration for the tunnel source interface, best not to forget that! If you want to be really fancy I guess you could set up an Event Manager script, or an IP SLA to track different interfaces (Dialer vs E0) and set these different options accordingly, but given this is a one-off switchover it didn't seem worth the effort. Big thanks to Arun for providing his configuration, and Billy for constantly letting me tinker with his router.